In 1938 as war with Germany came ever closer, it was realised by the Government that the trainingof men to maintain and fly the aircraft of war was essential if any kind of resistance was to be shown against the might of the German Luftwaffe. 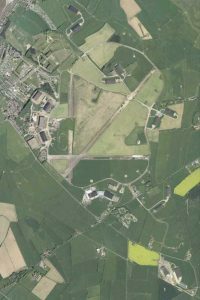 Silloth was chosen as one of these aerodromes, probably because of its remoteness from the main active regions down south, and on 5 June 1939 it was opened as No 22 maintenance command station. At the outbreak of war in September 1939 training aircraft were seen on the airfield, and by the 1st November 1939 No 1 Operational Training Unit of Coastal Command was established here with 22MU the lodger unit. The aircraft here were Fairey Battles, Blackburn Bothas, Lockheed Hudsons and Bristol Beauforts in which pilots, bomb aimers and gunners were trained and a lot of low flying exercises were carried out, especially along the Solway Coast. Avro Anson Mark 1 Aircraft were used frequently, “Faithful Annie” as they were known then, trained Pilots, Navigators, W.O.P.A.s (Wireless Operator Air Gunners) and Bomb Aimers. They were an excellent aircraft for all round training in the air, especially when combined with ground training such as Gunnery Radio and Navigation Courses, Parachute Practise, Mock-up Bombing Ranges and a host of other Training Facilities. On 15 July 1940 Silloth was bombed and this persuaded the authorities to build dispersal areas and many of the surrounding fields were taken over for this purpose, evidence of which can be seen to this day. By now the main training aircraft (Kites as they were called) were Lockheed Hudsons, and many young men were to lose their lives as training became more vigorous. Bombing practice over the Solway Firth using targets placed in the water, and gunnery practice by firuing at Drogues (like a huge windsock) towed along by old Fairy Battle Bombers was carried out. So many “Accidents” occurred over the Solway Firth that the area became known as “Hudson Bay”. An Air/Sea Rescue Unit was stationed in Silloth Docks and were called for many times during that period. The dangerous shifting sand of the Solway made it difficult for rescue and many aircraft and crew were buried there forever. 22MU handled many different kinds of aircraft and these were maintained by Civilian Technicians such as Riggers, Fitters, Instrument Makers, Armourers, Radio Mechanics (W.E.M.S. as they were called Wireless and Electrical Mechanics) and Electricians. For example, during the dessert campaigns of North African, hundreds of Hawker Hurrican11c Fighter Planes were prepared, made and quickly constructed at the factories of Hawker Company, they were flown by Air Transport Auxiliary (A.T.A.) pilots to Silloth where they were prepared for war roles. DesertCamouflaged, T.R. 1133 Radio Sets fitted, Cannon and Machine Guns fitted and harmonised. engines and instruments tested. Each aircraft was air tested by qualified test pilots, and when completely serviceable they were collected by A.T.A. pilots and flown to operational squadrons. When finally arriving at their desert squadrons, they were immediately ready to engage the enemy. Because of its good weather record, Silloth was regarded as a diversion airfield and many aircraft especially American were often diverted here from Prestwick. On March 10th 1943, Bomber Command took over as No 6 O.T.U. and No 1 O.T.U. left. Many Vickers Wellington Bombers were now to be seen over Silloth and the inevitable spate of crashes were unfortunately to take place. Some of these brave young airmen’s graves can be seen in the cemetery at St. Paul’s Church, Causewayhead, just outside Silloth. Attached to No 6 O.T.U. was 1429 C.O.T. Squadron (CZech Operational Training) flying Hudsons and they converted to Consolidated Liberators on 8 October , 1943 as 311 Squadron (Czech). Their barracks were situated on the South side of Silloth, some of which can still be seem. No 6 O.T.U. moved to Kinloss in July 1945 and Silloth 22MU was used as an Aircraft Storage Unit so that any aircraft could be brought into use at short notice if so required. The ferrying of aircraft was also carried out, and it became No 5 Ferry Pool when the A.T.A. finished. Many Avro Yorks, Lancasters and Douglas Dakotas were handled by the M.U. then, and Wayfarer aircarft were operated by Manx Airlines flying a scheduled service to and from Isle of Man in 1956. A Direction Finding Station operated there from 1960 controlled and operated automatically from London West Drayton and Prestwick Scotland, but maintained by eight Radio Technicians from 14MU Carlisle on a shift system, but in 1985 Octiber this became fully automatic and is still in operation. The 90ft TX (Transmitter) mast can be clearly seen on the old “D” site and the automatic D/F equipment can be seen in the middle of the Airfield. All that remains of a once proud and operational wartime training airfield are the Hangars and Runways – a reminder of the many young airmen who gave their lives for freedom. Silloth Tourism Action Group (STAG) received funding of £9,600 from Heritage Lottery Fund (HLF) for a project to explore the significance of the airfield and create ways in which memories could be archived and preserved. This film – edited by John Hamlett www.memoirfilms.co.uk – is one of several outcomes. The funded project has now ended but the legacy of the project has kickstarted further efforts to preserve the memories of the men and women who were based at the airfield during WW2 and its aftermath.